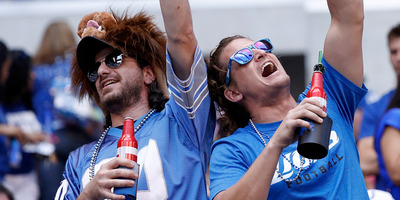 Joe Robbins/Getty ImagesDetroit Lions fans will have access to $US5 beers and $US2 hot dogs at Ford Field this season. The Detroit Lions announced on Tuesday that fans would be able to enjoy cheaper concessions during 2018 home games, including $US5 beers and $US2 hot dogs. The move comes after the Atlanta Falcons saw success with a similar program last season. With stadiums competing to keep fans coming to the games and customer satisfaction high, there’s a chance the trend could continue to catch on. The Detroit Lions are the latest team to embrace what may be a growing trend across the NFL – lowering the prices of beer and concessions on game days. Following the success of the Falcons, who embraced cheaper concessions last season and saw a dramatic uptick in both sales and customer satisfaction, the Detroit Lions announced on Tuesday that fans would be able to enjoy their beers and hot dogs without breaking the bank this season. The Lions plan involves multiple ways to entice fans to spend more. During the first hour after the doors open at Ford Field, fans will have the chance to enjoy the “DTE Power Hour” that will feature the biggest bargains available, including $US3 beers and mixed drinks and $US2 hot dogs. After the hour ends, significant deals will still be available at “Silver Savings” stands found in each concourse, that will offer $US5 beers and various combo deals such as a beer, hot dog, and bag of chips for $US12. Sports fans across Twitter were understandably pleased with the news. The Lions aren’t the only team to follow the Falcons lead and embrace cheaper concessions this season – back in May,the Baltimore Ravens announced a similar plan that would offer fans $US5 beers and $US3 hot dogs, with no single item costing more than $US9. While most NFL stadiums are still doing fine in terms of attendance – the Lions were 23rd in the league last year in overall attendance while filling 98.7% of their seats – there’s no denying that the home experience of enjoying a game has gotten more and more comfortable, and fan-centric changes will be necessary to keep people coming out on Sunday.